“Doctor Livingstone, I presume?” This famous, if probably historically inaccurate, line was uttered by the Anglo-American journalist Henry Morton Stanley on the shores of Lake Tanganyika, in November 1871. His mission to find the Scottish missionary and physician finally met with success, six years after the intrepid explorer disappeared into the wild. The natural landscape has hardly changed since that serendipitous encounter. However, the world and the African Continent have witnessed many changes and upheavals. Thanks to modern science, we can attribute endemic and epidemic illnesses to bacteria, parasites, fungi and viruses. Albert Schweitzer – theologian, philosopher, organist and physician – set up a hospital in Lambaréné (in modern-day Gabon), where he treated thousands of patients and, after a long and rewarding life, was buried. The inhabitants of Africa, who had lived for centuries under the colonialists’ boots, were fortunate to rid themselves of these oppressive regimes. However, the sovereign states remain largely underdeveloped and riddled with high mortality rates, in no small part due to deadly infections that have been all but contained elsewhere. Uganda was considered as the possible site for a Jewish state, an issue hotly debated at the Sixth Zionist Congress before being shelved for good. Two world wars, in part waged on African soil, rattled the globe since; at the end of the second, Jews, who survived the most murderous genocide in history, created the critical mass that gave rise to the establishment of the State of Israel. Over its 70-year existence, Israel has become a modern country, financially prosperous and advanced on many fronts, including military hardware, agriculture, technology, and medicine – particularly disaster medicine. Whenever natural or man-made catastrophe struck, whether in nearby Turkey or in far-flung Japan and Haiti, Israel dispatched large, well-trained aid teams to treat local casualties. I had the good fortune to participate in two of these humanitarian delegations. The first, to Rwanda, was in the wake of the civil war that ravaged the country in 1994, after which cholera and meningitis became rampant; the second, in 2001, was to north-western India, the site of a devastating earthquake. These experiences left a long-lasting impression on me. I learned that even a single physician could make a difference, either by treating patients in the immediate aftermath of disasters or, no less importantly, by training local medical staff. Medicine can be seen as a profession like any other, and doctors as mere service providers. According to this rather narrow perspective, each physician is committed to his or her patients alone; all a doctor needs to do is get a degree followed by a license, and then stick to the legal and ethical requirements of the profession. It goes without saying that most of us, physicians, would disagree with this simple definition. Rather than just a profession, we prefer to see medicine as a vocation, as our calling. We are emissaries of a greater good, representatives of science and progress, agents of empathy. We always put the good of the patients ahead of our own. We recite oaths and believe in them: starting with Hippocrates’, first delivered 2500 years ago, to later commitments drafted by Maimonides, and Prof. Ben Shlomo Lipman-Heilprin, a founding father of modern Israeli medical practice. In my toolbox, other than basic equipment, were pidgin English, local interpreters, hand gestures and a few expressions I learned in Luganda. Some might argue that in this age of materialism and hedonism, it is no longer realistic to expect physicians to invest their time and effort in unremunerated work. Is this true? But even our biggest sympathizers might object to the notion of traveling overseas: why travel halfway around the world, to a godforsaken African country, when one’s compatriots in Israel’s peripheral development towns and unrecognized Bedouin villages are in no less desperate need? Why not join a local organization, like Physicians for Human Rights, and treat asylum seekers in Tel Aviv’s central bus station area? Or, maybe, cross the Green Line and offer free medical treatment to the residents of the deprived refugee camps still scattered across the West Bank, literally on our doorstep? Surely doctors who reside in the country’s wealthier center can do more to improve the access of underprivileged people, be they Israelis Jews or Muslim Palestinians, to medical services. I don’t want to discourage anyone from doing that. I only wish to propose a possible alternative, for those looking for a different kind of challenge. Dr Halperin and a patient. Photo by Tal Appel. Some would say that a short stint of volunteer work in Africa, as beneficial as it can be, is just a drop in the bucket. Indeed, in one month, no matter how productive, one physician can treat no more than several hundred patients and save, at best, dozens of lives. But how many lives would a doctor save over the same period of time in the United States, Spain or France? And, come to think of it, how many lives do each of us normally save in Israel? One must bear in mind that a drop, and another one, and another one, will end up filling a bucket. Or at least half of it. What’s more, I believe that to every patient we treat – in Israel and elsewhere – the modified Talmudic verse applies: “He who saves the life of a single soul, saves the entire world”. Conversely, one might argue that by treating patients from destitute countries, Western doctors perpetuate the reliance of these countries on international aid, preventing them from developing their own resilience and standing up on their own. There is an element of truth in this claim. This is why a crucial component of our work is to train local medical professionals, no less than it is to treat those in need. With time, I came to realize that in my field – infectious diseases – there is much to be done. There are, however, many other arguments to be made against going on that adventure. Not only does one give up one’s income as well as family and modern living standards, one must also put up with long hours, and shortages of equipment and basic medication. Frustration, all-too-often, is the end result. Unmotivated and listless local staff, structural corruption, patients who prefer traditional doctors to modern ones (resulting in another healthy dose of frustration), the risk of exposure to life-threatening diseases, and the often precarious levels of personal safety – to mention but a few – hardly help either. But all these are greatly outweighed by the arguments in favor. Becoming intimately familiar with a foreign, often exotic, culture; having to rely on one’s own senses and quick-wittedness, given the shortage of diagnostic tests; hands-on experience with diseases that rarely manifest themselves in the developed world; a break from day-to-day Western medical bureaucracy; doing one’s share of public relations for Israel; but mostly – unlimited professional satisfaction, emanating from the simple act of providing medical treatment to people who desperately need it. Even within Africa, the quality of medical facilities is very uneven. There are well-equipped hospitals in big cities, yet scarcely a modern clinic in rural areas. This, of course, can have a significant effect on the lifestyle and work environment of the volunteer doctor. Considered as a whole, healthcare quality in Africa is, on average, significantly poorer than anywhere in the developed world. By way of illustration, I’ll mention Uganda – which is where I chose to go to. In “The Pearl of Africa,” infant mortality stands at 38 deaths per 1000 live births, as opposed to 3.5 in Israel; life expectancy, in this country of 40 million inhabitants, is 59 years as opposed to 82 in Israel; annual public expenditure on healthcare is $59 per capita, compared to $2910 in Israel; finally, and most crucially, there are a mere 12 licensed physicians per 100,000 people, as opposed to 350 in Israel. 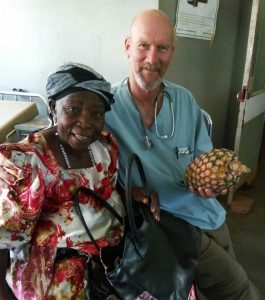 One of the great challenges that African medicine offers us, Western doctors, is a temptation that we must resist: casting ourselves as the white man – the Mzungu – bestowing progress and modernity onto poor and underprivileged natives is an easy trap to fall into. Rather, we must make an effort to see ourselves as equals to the local medical professionals, work in tandem with them, and try to understand in earnest the difficulties that they face day after day. A parallel temptation would be to forget that our stay is temporary: we’re not there to replace the local health care workers, but rather to train and empower them. However, the greater likelihood is that in remote places, the knowledge and skills of the local medical staff will not be up to par. For example, as an infectious diseases specialist I had to give a lot of training in administering antibiotics correctly. This essay was written in November 2017, after I completed another stint in Africa – this time as a “Brit Olam” fellow. For months, I worked at the public hospital in Kiboga, a small town 120 kilometers northwest of Kampala, the capital city of Uganda. During this period, I examined hundreds of patients suffering from various diseases and trauma. In my toolbox, other than basic equipment, were pidgin English, local interpreters, hand gestures and a few expressions I learned in Luganda – a language in which, I came to learn, my name is Efulayimu. I ordered blood tests, some of which I had to run myself. On the other hand, I insisted on sending an urgent sample to the Uganda Virus Research Institute, accurately diagnosing a young man as suffering from Crimean–Congo hemorrhagic fever – a contagious disease that may well have turned into a large-scale epidemic if it had remained undetected. Due to the lack of running water in the hospital building, I had to wash my hands with rain water stored in large plastic containers. Left without alternatives, I received the mutilated bodies of thieves caught in the act and lynched by angry mobs – a well-known, though somewhat downplayed, Ugandan reality. When I prescribed painkillers or medicines to lower blood pressure, I wondered how many of these drugs would turn out to be counterfeit, thus risking my patients’ health. I gave blood transfusions to a 70-year-old woman who had been sent to see me with staggeringly low hemoglobin levels (1.9 per deciliter! ), and was thrilled to discharge her two days later. I examined a terribly malnourished 14-month-old boy, weighing just four kilos. I used my expense budget to purchase medications in private pharmacies, when the hospital repositories proved lacking, and bought food and drinks for penniless patients who had no-one to look after them. Left without alternatives, I received the mutilated bodies of thieves caught in the act and lynched by angry mobs – a well-known, though somewhat downplayed, Ugandan reality. I found out that due to the shortage of trained doctors, the country’s health system relied on the so-called Clinical Officers, who are allowed to diagnose, treat and discharge patients, and even perform minor surgeries after completing just three years of medical training. Overwhelmed, these dedicated and cooperative health professionals occasionally sent me some of the more complex cases; and sometimes even I, lacking better resources, had to refer my patients to the bigger and better equipped hospitals in Hoima or Mulago. I trained local nurses and students, as well as a young and tremendously committed Israeli resident who joined me for a month. I learned a lot from all of them too. The tragedy of seeing some of my patients die prematurely was subsumed – up to a point – by the sense of accomplishment upon parting with thankful, recovering ones. Like I said, the whole experience was bittersweet, at times heart-warming and at other times terribly disheartening. Early in the mornings, before going to the hospital, I roamed the dirt roads around Kiboga, and the narrow trails leading to the nearby mountains. I was exposed to mind-blowing natural beauty, rich and strange tropical flora, and beautiful rainbow-colored birds. Along the way I met kids, on their long trek to school, who tried to befriend me; I watched hardworking men and women, carrying heavy water cans to their ramshackle shacks and digging diligently in their small gardens. I talked sports and politics with the friendly locals, enjoyed the hospitality of two sisters who hosted me in Entebbe, and met a few young Israeli idealists volunteering at a field school on the shores of Lake Victoria. I was awestruck by the Ugandans’ colorful garb, and ordered a dashiki – a traditional African shirt – from an affable seamstress. I became familiar with Okot p’Bitek’s body of literary work, and toyed with the idea of translating two of his poems into Hebrew. I tasted common and simple dishes like matooke, posho, g-nuts, rolex and kicommando, as well as lots of fresh pineapples, mangos and other fruits I had not seen or heard of before. Nonetheless, during my African escapade I lost about 10 percent of my body weight, and reduced my BMI from 26.1 to a much healthier 22.9. But I was primarily there to cure patients and save lives, which, to my satisfaction, I was able to do. The author would like to thank Dr. Avi Garfinkel, of the College of Literary Arts in Jerusalem, and to Mr. Ioram Melcer, the editor of Alaxon digital journal, for their help in writing this essay.